Celtic green is shimmering, soothing, lush, and traditional, but also bubbly and effervescent. Small beadlet scales of eye-popping color come in beautiful blends of green that are calming, comforting, and realistic. It is sporty and fully lined. Please note that you must purchase a top separately. These are high- quality, four-way stretch fabrics resistant to chlorine and made for swimming.The fabric is durable, made of a high-quality blend that is 82% polyester and 18% spandex. Now you can order a matching bikini bottom with your favorite mermaid top! 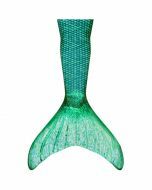 It is elegant and fully lined and the design is new to Fin Fun Mermaid. Please note that you must purchase a top separately, or you can easily purchase both in our sets category.